Hexband is the new improved product from Otto Design Works offering improved security and durability. In March ’19 the company plans to sell a version of their “cafe lock” design with better engineering and much improved security features. Coincidentally the Ottolock has taken a lot of flack in the past few months mainly due to criticism that it’s too easy to break into. 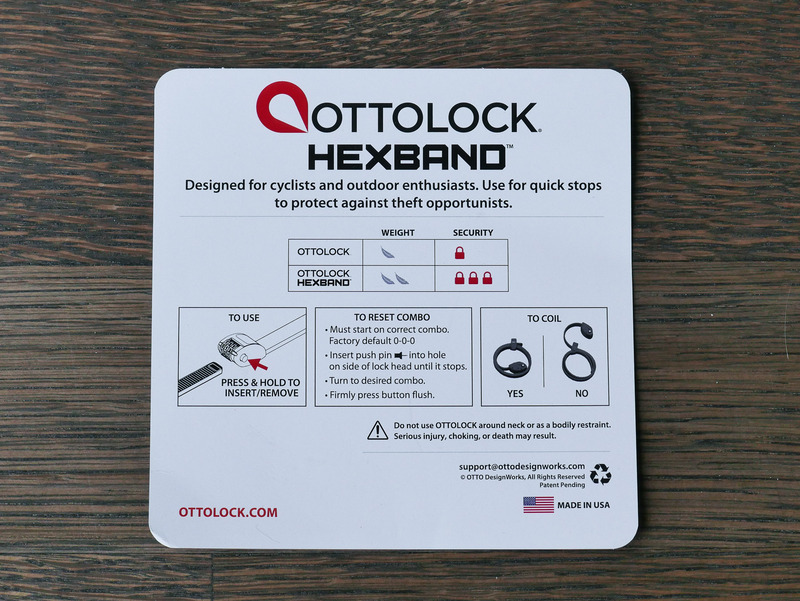 Having used the Ottolock for over a year now, mainly as a “cafe style” lock I never had an issue and its been a great opportunist theft deterrent when locking up all kinds of things including bikes and coolers when camping. Before we get into the nuts and bolts, where the beauty lies in flexible locks is versatility. I love the multi-use functionality that Ottolock provided when securing various things including front wheels, bikes to car racks, camping coolers and even moving dolly’s. Needless to say it’s versatile lock that prevents an opportunist theft which may not have been covered otherwise. The tumbler case / head got tougher with a Zinc based housing. Hexband is beefed up in various areas but yet retains the same small, portable lock feel. The unit looks very similar to Ottolock, and I should point out that I have an refined sample, as things are still changing before final release. The Hexband I have sports matte grey finish, no color cerakote. It looks durable and somewhat sophisticated, at this point it’s unknown as to the color options on this new product. The new Zinc heads can be identified with the logo mark on top near the tumblers. 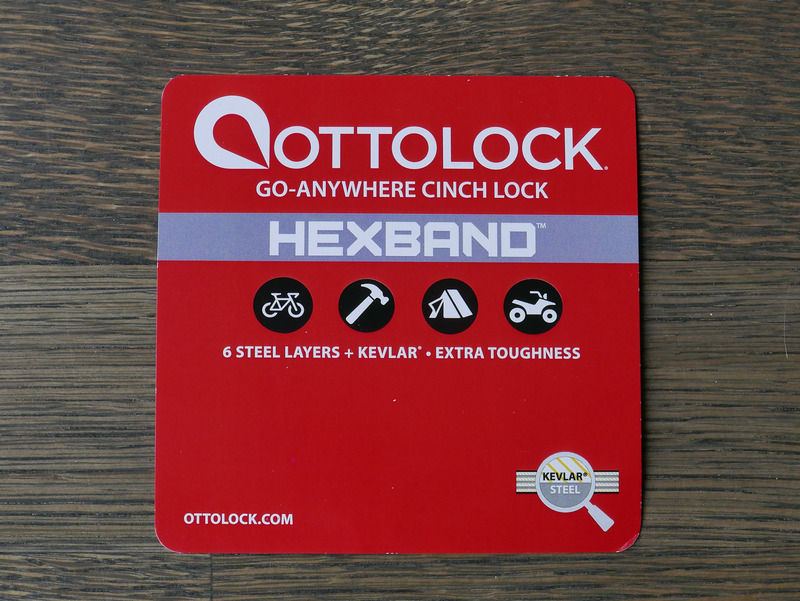 A tad heavier – The Hexband is ~60g heavier than the Ottolock Gen 2.5. The weight is in new materials in the band and the head. The head is made from a special grade of Zinc which is stronger and more durable. (introduced in Ottolock 3 -Sept 2018). Earlier Ottolock’s locks were made from a type of aluminium alloy. This additional weight is slightly noticeable in hand , but only being a few grams it will not affect usage or the way you carry it – it’s still highly portable. The band got tougher and more secure with 6 layers of steel instead of 3 in the Ottolock. The Kevlar fabric layers are still present and prevents breakage from twisting motions and cutting from knife attacks (Kevlar fibre dull blades). The band feels a touch stiffer and less flexible than the current Ottolock, which makes sense due to the added material. My band sample is slightly thicker, but not by much, in fact I think this is just production variance. A rumor is the company is beefing up the thickness of 6 steel bands before the launch in March, so the band may get more hearty than this review. In a prior review I cut apart an Ottolock to show the innards and judge how easy it was to get into. Since this is a bit of a pre release I’m reserving judgement for now, and when I get the final version (with even thicker steel?) I will confirm the new construction of Hexband with some pictures and tests. The tumblers feel notably different – a harder more clicky feel reveals some modifications to the inside internal engineering has taken place to further prevent against picking. I had heard some feedback that the Ottolock’s tumblers were too sloppy feeling, so this change will be accepted well. The company has also optimized grease placement also, too much grease can attract dirt that can jam the mechanism. Otto Design works is based in Willsonville, Oregon and have so far not released pricing or firm release dates. The first look is promising, the weight penalty is negligible and the increase in security is always welcome. I will be using the Hexband over the next few weeks before evaluating again, including a tear down of the band and technologies. Stay tuned for further investigations.